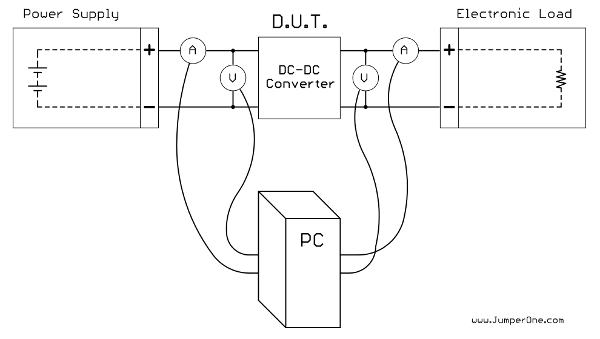 Designing a DC to DC converter is a bit more problematic than using linear regulator. And one of the things you need to do – is to graph its efficiency vs. output current, or input voltage, etc. That’s a pretty flat response and high efficiency – but that’s not always like that. Usually this kind of things is done using programmable power supply in conjunction with programmable electronic load and some software, like LabView or even simple Python scripts + some spreadsheet software. When you don’t have programmable power supply and/or programmable electronic load – then you have to do this manually with four multimeters, spreadsheet software and maybe a piece of paper. And if you need to do this every time when you changing some aspect of you converter, like inductor, for example – then you wasting lots of time, plus you’ll be bored to death pretty soon. 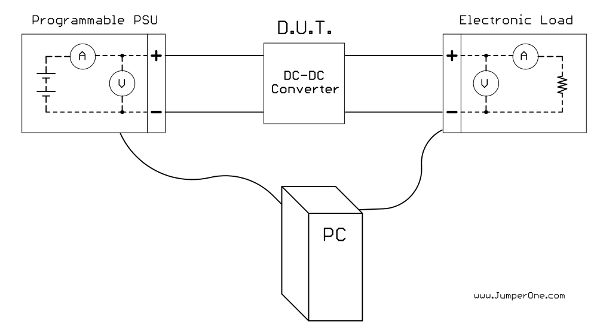 So the idea is to connect those four multimeters to your computer and write specialized software which would help to effortlessly make those efficiency graphs of DC-DC or/and AC-DC converters. Did I say it’s cheap? Four cheap multimeters with decent accuracy, resolution and PC connectivity would cost you next to nothing. For example UNI-T UT61E 22000 counts DMM with DC accuracy (+/-)0.1%+2 counts cost only $65. Of course that accuracy would be much lower in time, but still! It is somewhat slower with cheap multimeters than with using proper PSU and EL, but for that price – who cares? Someone has to write this software.. Unfortunately right now I don’t have much time to sit and write this piece of software. I was going to write it from scratch using C++ and QT – so it can run on Windows, Linux and Mac. Plus I wanted it to be open source. But since right now I’ve got lots of things to do, I’ve decided to just write this small article, so maybe someone would want to do this. But! There’s already big part of the job is done. Guys from http://sigrok.org have already done interfacing with different multimeters and other measurement equipment. It’s an actively developing project, that needs more contributors, so visit http://sigrok.org – they need your help to put more devices to the “supported devices” list. So having drivers for various multimeters in place, there only left to write a software that can take that output, do some calculations and make a graph(s). And I understand, that it’s not that easy to do that, in fact many and many hours needed to develop a GUI, make internal logic and don’t forget about usability. But as I said, if I can’t do it right now, I don’t want to keep this idea(if you can call it that) to myself. Maybe it’ll eventually help someone… who knows?